Things are off to an exciting start here in Annapolis! Unfortunately, we didn’t get to have fun sledding in the snow, but we’ve been hard at work, starting hearings, requesting bills, and helping the new delegates to not get lost! 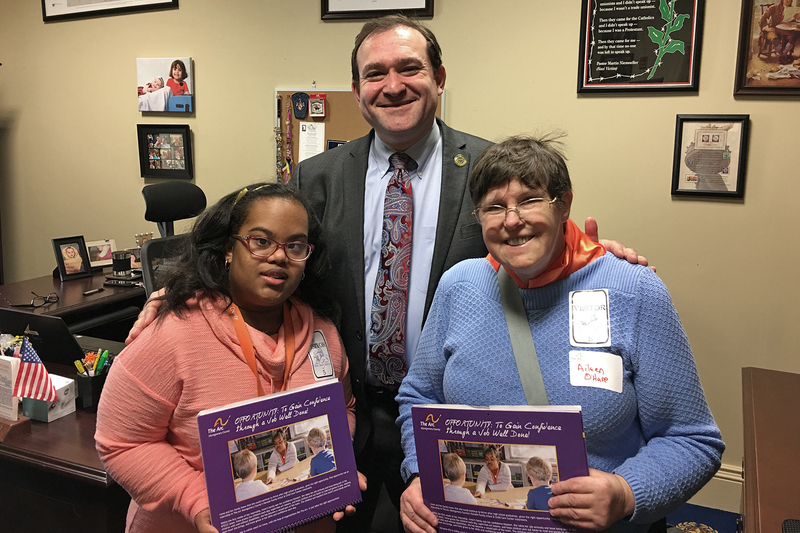 I had my first constituent visit of the 2019 session when Irene and Aileen from the Arc of Montgomery County stopped by with their fabulous calendar. It’s always a pleasure to work with the Arc to help them provide invaluable services to our community. Unfortunately, the Federal Government shutdown continues, and I know many Montgomery County residents have been hit hard. Congressman Jamie Raskin has put together a wonderful list of local, state, and federal resources available to those affected. If you have been affected by the shutdown, and need help navigating your options, please don’t hesitate to contact my office. Redistricting Reform and Potomac Compact. For several years, I have been working to pass fair and effective redistricting reform in Maryland. Utilizing a system being employed in Iowa to allow professional staff to do the redistricting decisions, the bill also creates a compact between Maryland and Virginia to move forward with redistricting together. Privacy and Net Neutrality Protections. This bill is an attempt to counteract the repercussions from the FCC’s decision to repeal Net Neutrality rules. A number of States, like Washington and California, have already passed similar legislation. This bill will utilize certain powers of the State, such as regulation of cable and telephone utilities, and procurement powers, to force Internet Service Providers to abide by net neutrality provisions. Free Feminine Hygiene Products in Public Schools. This bill will require schools to stock sanitary pads and tampons in bathrooms for students in grades 6-12, at no charge to the students. Access to these products can be a barrier to school attendance and performance for many students, and having ready access can greatly reduce the stigma surrounding menstruation. There is no reason school should not treat the need for these products in the same way students need all other toiletries currently provided to everyone, such as toilet paper, soap, and paper towels. Upgrade of Robotics Grants Program. Three years ago, I sponsored legislation to crate a grands program to support public school robotics clubs. It has been a huge success. This bill is an expansion of that bill to provide funding for robotic clubs also include community clubs and non-profits to apply for grants, and increase the amount of funding for the program. State Song – Advisory Panel. Our state song, “Maryland, My Maryland” has a troubled, racist history, and does not reflect the Maryland of today. The purpose of the legislation is to repeal the State song, create an Advisory Panel to review submissions and suggestions to find an alternative. The Advisory Panel will be required to conduct public hearings and report recommendations to the Governor and the General Assembly. I will be submitted more legislation next week, so stay tuned. *RideOn route 75 has resumed bus service to the Germantown MARC station, at popular request by D39 residents, and with help from County Councilmember Hans Riemer. For more information, please CLICK HERE. *In honor of National Children’s Dental Health Month, free dental health screenings as well as preventive and restorative dental care for uninsured children (Ages: 0-18 years Old) is being offered at Wisteria Dental Cares. Please call (301) 515-0030 or email at mail@wisteriadental.com to set up an appointment. I have a new phone number for my District Office. For all of my contact information, please go to my website HERE. You can always reach out by calling or emailing my Annapolis office or District office. You can also connect with my on Facebook or Twitter.